53-59 Miller Street, Glasgow. G1. The Virginian Tavern was opened in the summer of 1974 by Tony Queen and Pat Harkins. 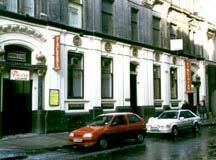 A touch of the New Orleans had been introduced to Glasgow with the opening of the Virginian in Miller Street. The joint enterprise was the brains of Tony Queen, who had sold most of his bookmaking interests and Pat Harkins a master chef and publican who had travelled the world. It was from the restaurants of New Orleans that the Virginian took its inspiration. Pat Harkins collected a range of recipes from that city so that Glasgow could have a taste of Creole cuisine. Creole cuisine is a combination of the best French/Spanish/Italian cooking traditions and there is also a fair mixture of the native American Indian influence. The Virginian had two lounges a restaurant and a dance floor. In the 1990s this once famous pub diner was called Pacers. Included in this photograph are Tony Queen, Pat Harkins, A McAuley, Pig & Whistle, C Sweeney, Arlington Bar, J Murray, Dunn & Moore, W Martin, Calypso Bar, J Bailie manager of the Virginian, Mr Smyth, the Anvil and T Doherty, Dunn & Moore. 1974.